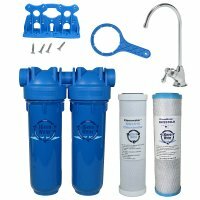 Our KleenWater KW1000 under sink drinking water filter system is designed for chloramine, chlorine, lead, cyst and sediment removal. This system includes an elegant Euro Style design chrome faucet. This faucet conforms with Federal Reduction of Lead Act 2014. Our dual cartridge drinking water system has exceptional filtration / treatment capabilities. The KW2510LR carbon block filter absorbs chlorine, taste odor contaminants and VOC's (volatile organic compounds). 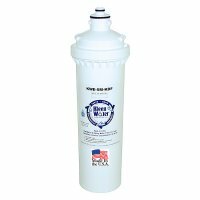 This filter is proudly made in the USA and is rated for lead removal for up to 2,500 gallons. Lead is removed by incorporating an ion exchange filter media into the carbon block extrusion. Chloramine, an alternative to chlorine, is becoming a more common disinfectant used in public water supplies. Chloramines are deadly to fresh water and salt water fish. The KW1000 system removes chloramines and provides safe water for drinking, cooking, aquariums and aquaculture. All components are included to make installation quick and easy. For additional replacement cartridge sets please search KW2510LR-KW2510-Chloramine.